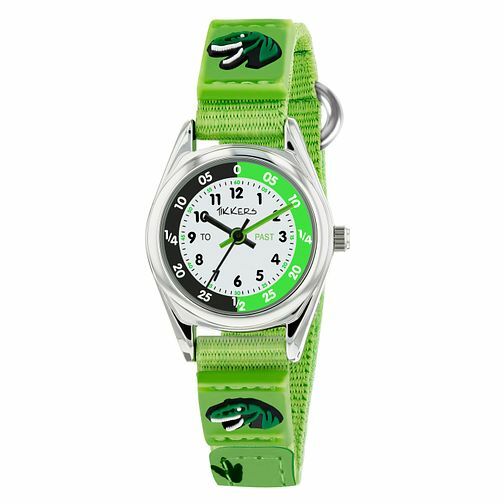 Make learning to tell the time a fun experience with this playful green Dinosaur strap watch. Featuring a green strap, adorned with playful dinosaur images. The dial is split in to two handy sections, teaching children the correct terminology for telling the time. Your little one will not want to take off this stylish watch. Tikkers Green Dinosaur Strap Time Teacher Watch is rated 4.0 out of 5 by 2. Rated 5 out of 5 by Anonymous from Great product Very good watch for little ones starting to learn to tell the time. I got this for my 6 year old son, he loves it. It’s easy to put on and take off, the face is clear to see. Excellent product would definitely recommend. Rated 3 out of 5 by Anonymous from Broken box Brought this watch for my little boy for Xmas, however, when it was delivered I opened the delivery box to discover the watch case was cracked.